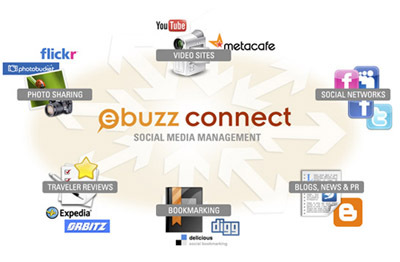 Santa Clara, CA - Milestone Internet Marketing announced today the launch of eBuzz ConnectTM Social Media Management System targeted at the hospitality and travel industries. 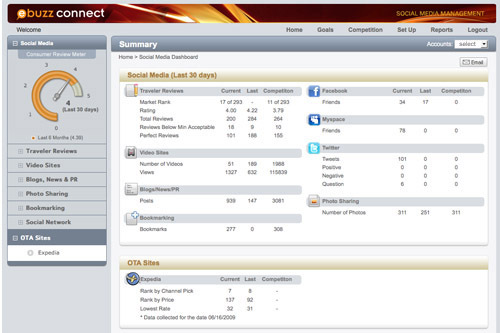 eBuzz ConnectTM is an online Social Media Management system for hotels, restaurants, and businesses to manage online reputation and social media channels from an integrated single interface. In addition to Social Media channels, eBuzz ConnectTM also monitors Online Travel Agency channels such as Expedia and Travelocity. Hotels can measure their performance against social media marketing goals and benchmark their performance vs. competitors using the system. Social Media Marketing is the next frontier of "organic optimization." As Social Media sites continue to grow in popularity, it is important for hotels to include these channels in their online marketing strategies, especially when references from these sites are considered important ranking factors by search engines. Hotels that take advantage of this trend and put an effort in managing their online reputation are seeing significant benefits in terms of online placement and increased revenue. Over the last few years, Milestone has collected substantial return on investment data from social media marketing efforts for several hotel industry clients (see GravitiTM for more information). eBuzz ConnectTM is derived from the results of these marketing efforts and focuses on the social media channels found most effective for the hotel industry. The system is designed as a central warehouse for collecting and storing data from multiple Web 2.0 and Social Media sites and the capability to present data to the user in easy-to-read dashboard reports and desktop delivery reports. The architecture provides an easy to navigate social media dashboard with summarized reports segmented by the type of channel such as Travel Reviews, Blogs and News, Photo Sharing, Videos, Bookmarking, and Social Networks and easy ability to drill down into each of the channels. Milestone Internet Marketing, Inc. is a leading provider of Internet marketing solutions for the lodging industry. Milestone's portfolio of services included Website Design, Search Engine Optimization, Pay-per-Click marketing, Email marketing, and several Social Media Optimization initiatives like Online Videos, Blogs, RSS, etc. Milestone currently works with over 700 hotels and drives over $150M in annual revenue for its clients. Milestone is a preferred vendor for several major lodging industry brands and works with some of the leading management companies in the US. Milestone is also well known as a lodging industry educator for its Hotels to HTMLs internet marketing workshops and book. For more information on our products and services, please visit www.milestoneinternet.com or email [email protected] or call (888) 350-8396.